Pay on Foot /Pay on foot LED solar powered sign / Pay in Lane Cover- Little Buildings, Inc.
Pay on Foot Canopy, Pay Station Canopies, and Pay in Lane Canopies by Little Buildings, Inc. provide clients help protect from the elements including direct sunlight, which sometimes obscures the screen, and rain. Customers will appreciate this product and will tend to do business with you again. They also help keep water off of credit cards which can cause expensive repairs or down time avoiding expensive service calls! 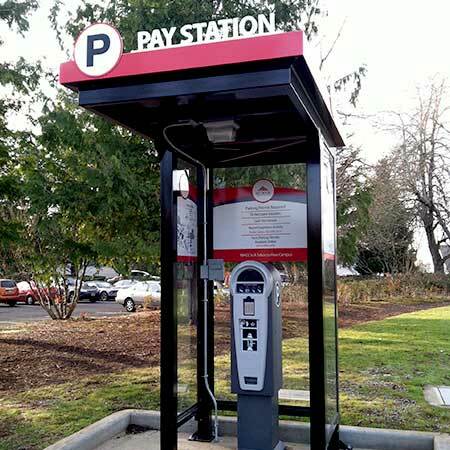 Pay on foot canopy and Pay Station Canopy are economical as well as practical. They ship from the factory fully assembled, ready to set, connect, and use! How are they made? 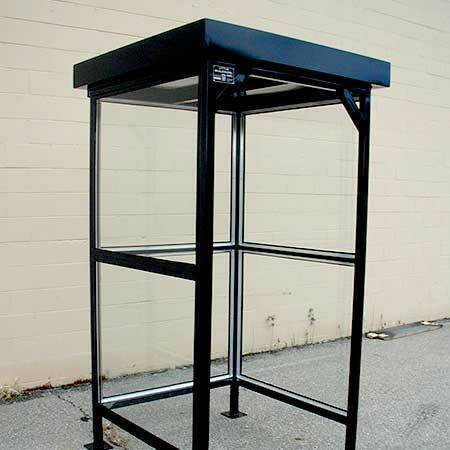 Pay on foot canopy, Pay Station Canopy, and Pay in Lane Shelter are all built from welded, galvanized steel for years of rugged service. Glazing is clear tempered safety glass. 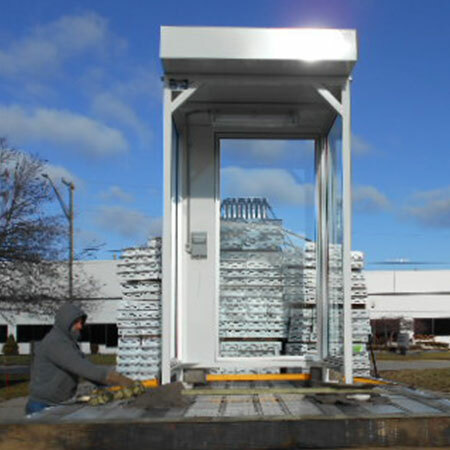 A lifting ring is provided in the roof for unloading or for ease of relocating your pay on foot canopies if necessary. Check out our exciting newly designed product, pay on foot lighted sign in the pictures below. Winner of a design contest between competitive vendors, this unit won the blue ribbon, at a better price! A winning addition to pay on foot machines of all brands! Customers in parking lots sometimes have a hard time finding where to pay in a large parking lot, especially at night. Help them find your meter and get them on their way by providing them a solar powered pay on foot LED lighted sign from Little Buildings! The low energy use LED lamps will last for years and provide 1130 lumens, enough to light up the sign and the area directly around your pay on foot machine. 45 Watt solar panel is included with battery pack to keep your clients in the know! Electronic settings can allow you to adjust the time the sign stays on from 5 hours or from dusk 'til dawn. Contact us for a price on few solar powered pay on foot LED lighted sign for YOUR new parking lot installation! Can I get a different design? What if I don't see what I want? Sure! Little Buildings in house engineers and AutoCAD operators can help get you the look for your pay on foot shelter or Pay Station Canopy you want. Just contact us and we will work with you. Are there any options available on pay on foot enclosures or pay in lane shelters?? You name it, from solar powered lighting, tinted glass, glazed roofs, camera mounts, outside lights, etc. Does Little Buildings make different sizes? Yes! 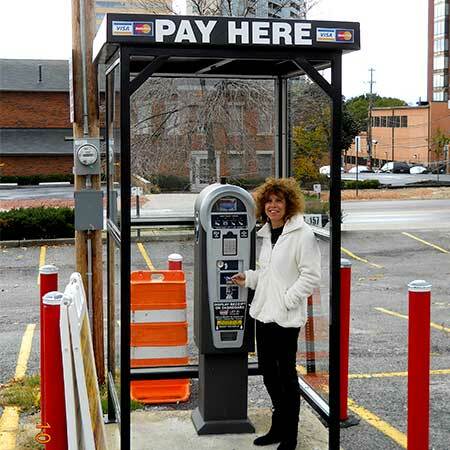 Each pay on foot canopy and pay station canopy starts from scratch, so we can build exactly what you need, including fully enclosed models with heat, light, doors, and signage! Some options may be shown. Little Buildings, Inc. reserves the right to make improvements and modifications without notice.